Advanced Micro Devices officially began shipping its Kaveri chip architecture on Tuesday, claiming better price and performance than the Intel Core i5 chips released in the middle of 2013. And if you use AMD's optimized APIs, company executives said, then they'll do even better. Late last year, AMD announced that the Kaveri would ship in January. And at last week's Consumer Electronics Show, AMD executives revealed that the new architecture, which integrates graphics and computing capabilities, would no longer distinguish between the two. Instead, AMD said that the more powerful version of the desktop Kaveri chip would contain 12 "compute cores," consisting of a 8 GPU cores and 4 CPU cores. A third, lower-power variant, the 3.1GHz and 3.3GHz A8-7600, will ship later in the first quarter for about $119. Those prices are roughly equal to the Core i5 chips that Intel released in the second quarter of 2013, meaning that Intel is expected to leapfrog AMD yet again when it introduces its delayed "Broadwell" architecture later this year. The A10-7850K and A10-7700K are both designed to consume 95 watts. But the A10-7700K contains only 6 GPU cores, as well as 4 CPU cores. Kaveri combines several of AMD's recent innovations: a Heterogenous System Architecture that facilitates the transfer of data between the computing and graphics cores; the Graphics Core Next architecture underpinning AMD's latest Radeon cores; TrueAudio, a technology that allows game designers to create numerous independent audio sources, in much the same way independent lights can be present in a scene; and Mantle, AMD's own API that writes specifically to the AMD hardware more efficiently than Microsoft's Direct3D. Whether it be through an early leap to 64-bit computing, design optimizations, or other enhancements, AMD has always worked to overcome Intel's ability to manufacture chips more efficiently than rivals. At a workshop before the Consumer Electronics Show in Las Vegas, AMD offered more details on its new weapons: OpenCL and its own Mantle technology. OpenCL is managed by the Khronos Group, not AMD. But the technology has slowly become adopted as a way to offload traditional CPU programming functions onto the GPU. Michael Meeks, vice president of productivity at Collabora, which oversees LibreOffice, said that the users could see up to a 20X performance improvement in its Calc database program by taking advantage of OpenCL support built into Kaveri. And while AMD's benchmarks indicated that Kaveri has the native horsepower to run many popular games--including the "ten most popular games of the last decade" at 1080p resolution, and at 30 frames per second--AMD is still encouraging developers to use Mantle, the low-level API it launched last year with its R7 and R9 series of graphics cards. 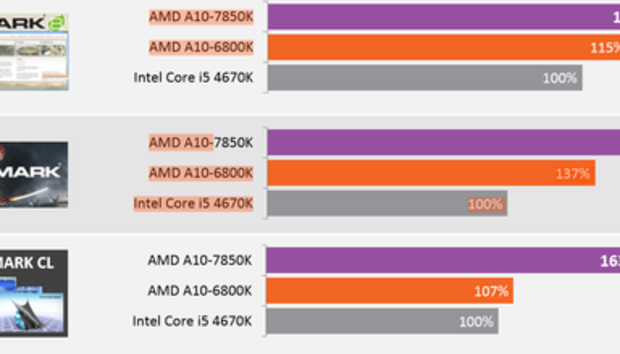 Each of the A10 APUs will be bundled together with a $60 copy of Battlefield 4, AMD said. And that's significant, given that AMD executives also revealed that a Mantle-optimized version of the same game offers 45 percent more performance than DirectX alone. All told, the Kaveri chip has the horsepower to process 4K video at 60 hertz, executives said. AMD even suggested that Kaveri could pay for itself: in mining Lottocoins, an alternative form of currency, AMD projected that it would earn $704 per year--disregarding the cost of the power to run it, of course. So far, we've enjoyed a relative period of peace between graphics architectures, with DirectX serving as a mediator between the two. Will Mantle and OpenCL open a new era of games optimized for specific graphics architectures? AMD certainly hopes so.